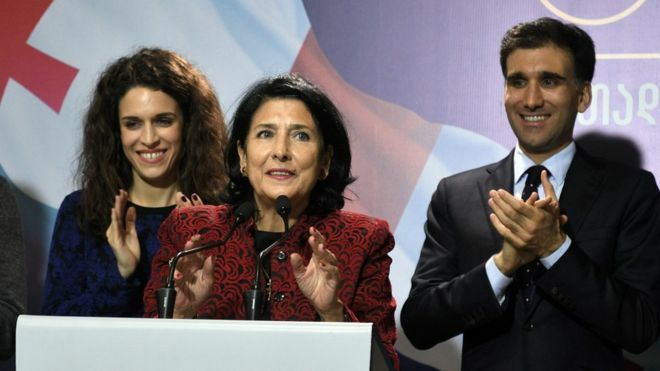 (Tbilisi) – Georgia´s newly elected President Salome Zurabishvili hailed her victory as a step forward for women and a move closer to Europe for the ex-Soviet republic. With all votes counted, the country´s election commission said the French-born ex-diplomat, backed by the ruling Georgian Dream party, had taken 59.52 percent of the second-round vote. Her rival Grigol Vashadze, from an alliance of 11 opposition parties led by exiled ex-president Mikheil Saakashvili´s United National Movement (UNM), took 40.48 percent. The opposition denounced the election as a fraud. But while raising some serious concerns, foreign observers said the vote was “competitive” and well-run. “It feels great,” she said, pointing out that she was one of a small number of women presidents in the world. The election was seen as a test of Georgia´s democratic credentials as it seeks European Union and NATO membership.